That’s right. I spent most of March in the company of various bacteria and viruses, feeling very sorry for myself and generally kicking up a great fuss whenever Tanmoy was within ear-shot. The poor man had no respite from my cold. I moaned and groaned and wheezed and coughed and sniffed and sneezed. He ran to comfort me every single time. To give us a glimpse of what the future might hold for the two of us, some of the bacteria made themselves at home in my ears and for a week, I was quite deaf. I think that was the part Tanmoy rather enjoyed. Who doesn’t want a deaf wife, after all? A deaf husband – well all women have one, but most guys would give an arm and a leg for a deaf wife. Anyway he and some friends even planned a surprise birthday party for me right under my snivelly nose, and I didn’t catch a whiff of it. At the party, I spent my time lip-reading and bravely hazarding responses having used my excellent brain to guess what had been said. I also stayed out of the kitchen. Tanmoy rose to the occasion and managed to keep the two of us alive for a week. After that he gave up. Not wanting to die in a foreign land, I managed to scrape up some really basic meals for the rest of the days, but those were nothing to write about. The recipe I’m sharing with you today is something I made a long time ago, but the pictures lay forgotten in my camera for more than a couple of months as I proceeded to pour soup into your bowls. It’s a very simple baked salmon, and was the first thing I made in my new little toaster oven – absolutely nothing fancy. The flavours are subtle and because it uses such few ingredients, each one comes through distinctively – whether the basil or the cherry tomatoes or the salmon itself. 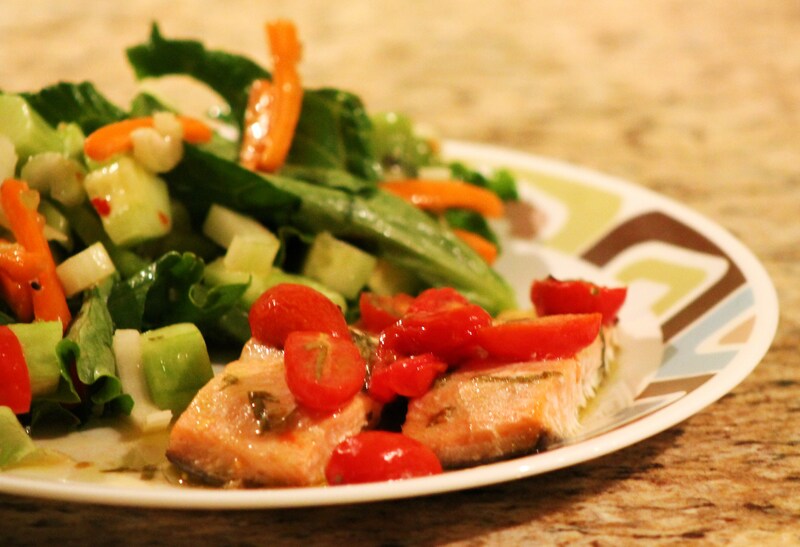 Salmon is a fish that can stand on its own and really requires very little support from spices. Also, it cooks really quickly and this dish requires such little preparation that it’s a perfect light meal for a busy weeknight. In a small bowl, whisk together the olive oil, lemon juice, lemon peel slivers, basil, minced garlic and half the salt you would use. Add the halved cherry tomatoes and mix well. Arrange the salmon filets in a glass baking dish, skin side down if they aren’t skinless, and pour the olive oil mixture over them. Move them around a bit to ensure the filets are evenly coated on all sides. Let a few of the tomatoes rest on the salmon. Sprinkle the remaining salt directly on the fish. Bake in the center of the oven for about 20 minutes or until the fish flakes easily. Serve warm with a fresh salad on the side. Do not overcook or the fish will be dry and chewy. Check midway through the baking and if the fish seems to be drying out, scoop up some of the marinade from the baking dish with a spoon and pour it over the salmon.